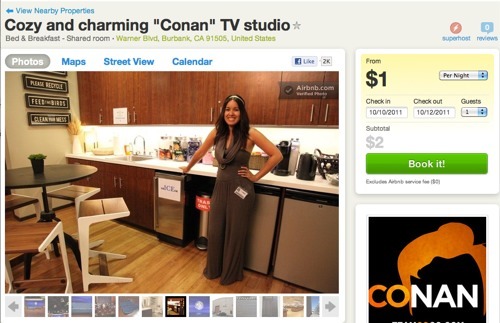 TeamCoco, the digital team behind "Conan," is sharing its studio in October to Los Angeles tourists through Airbnb. There is a catch, however. "Conan" will film the guests' entire stay and be featured on the show. The room type is a shared room and guests will have access to the couch, which has been grazed by celebrities, and an air mattress. Interested guests must first contact TeamCoco for details before booking. See listing here.